From Southern California to Northwestern Maine, we’ve compiled a virtual journey through outdoor beer gardens in the US 50 states. 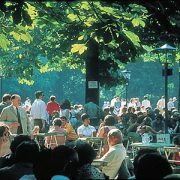 Our selection criteria: some outdoor seating with trees, communal benches, authentic beers (not necessarily from Germany), sausages on the menu, “Biergarten” or “beer garden” in the establishment’s name, and an atmosphere of Gemütlichkeit (comfort and coziness). Some beer gardens are off the beaten track, some right downtown in major urban centers. Explore these beer gardens through following the links below! This list is by no means comprehensive. If there’s a beer garden you think your fellow readers should know about, please let us know. You might also be interested in checking out our list of German Restaurants in the US or German Restaurants in Canada, or learn more about the original Munich beer garden.